Remember your Irish friends and honor Irish heritage with these beautiful Celtic notes or a card with a blessing by St. Patrick. 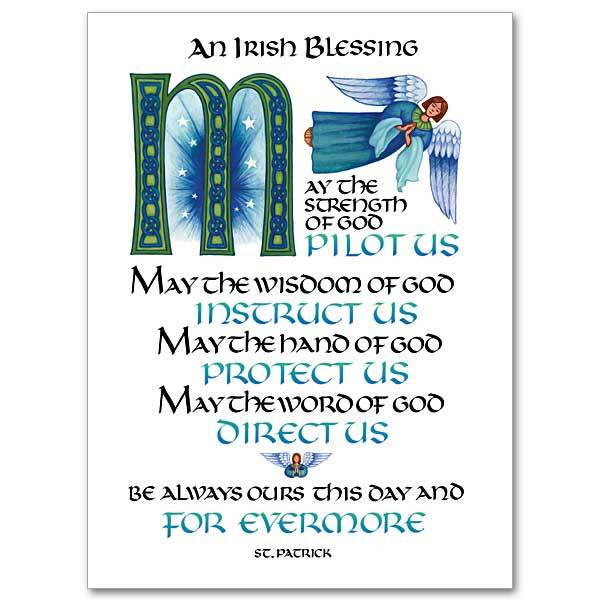 This entry was posted in St. Patrick's Day and tagged Catholic cards, Christian greeting cards, religious cards, The Printery House on March 2, 2015 by Printery House. Think about it for a moment: When’s the last time you sat down and wrote a nice card or letter to your dad, or someone who’s been like a dad? If it’s been a while, go for it this year. It may seem like a challenge, but you’ll never regret it. If you’re wondering how to get started on ways to “speak your love” to dad, take heart. Many Christian cards for Father’s Day can help you find the right words to express gratitude, joy, fond memories or just to let dad know he’s special. They can also inspire you to include a handwritten message that speaks to the heart and makes the card that much more meaningful. What’s one special memory you have with him? It doesn’t have to be a holiday, or anything considered a “big” moment. It can be a simple gesture or experience you had with him that he may not even realize made such an impression on your life. Share it in a few sentences. Did Dad take part in acts of service that impacted you? Mention it to him inside a card. Sometimes it’s the selfless acts like reaching out to an elderly neighbor or involvement in a church project that you remember so well – and he’ll be so thrilled that you noticed his acts of service. What’s funny about Dad? All dads are funny in their own way. If he says or does something that always gives you a chuckle, let him know. This is a lighthearted way to express your love and appreciation that’s still very meaningful. What did you learn from dad? Maybe it was how to mow the yard or change a tire. Maybe it was managing money, a favorite recipe or how to respect your elders. Whatever you learned from dad, take a moment to let him know in a few sentences. He’ll treasure the knowledge he’s passed on to you, even if it seems like something commonplace. As you consider finding the right Christian cards for Father’s Day, think of buying from a made-in-the-USA source that has a great story of its own: The Printery House. For more than 60 years, The Printery House has created and lettered unique religious greeting card designs and stationary, all from the on-site print shop in the hills of northwest Missouri. All sales are part of the apostolic work of the monks at Conception Abbey, so you’ll know you’re making a difference. This entry was posted in Christian Cards, Fathers Day and tagged Catholic cards, Christian card for Fathers Day, Christian cards, Fathers Day gifts, gifts for Fathers Day, religious cards, The Printery House on June 6, 2014 by admin.